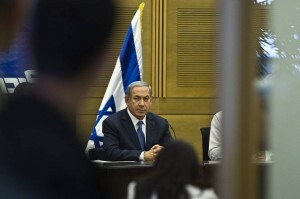 Desire for agreement “stronger than anything else,” Israeli leader says. The Israeli leader’s criticism of the accord reflects his long-standing opposition to the talks and his view that the deal will leave Iran with ability to build a weapon within weeks. In comments to reporters before talks with Dutch Foreign Minister Bert Koenders in Jerusalem, Mr. Netanyahu also warned that lifting economic sanctions on Iran will give Tehran “hundreds of billions of dollars” to boost support its allies in the Middle East that are also Israel’s enemies. Mr. Netanyahu’s public attacks against the Obama administration over its negotiations with Iran—most notably before a joint session of U.S. Congress last March—has frayed U.S.-Israeli ties. Although most Israeli politicians share his skepticism about the agreement, the Israeli premier has been criticized by opposition politicians for his confrontational approach toward the U.S.
Israel is expected to actively lobby U.S. legislators against the deal. Israeli Deputy Foreign Minister Tzipi Hotovely pointed to such an effort in her reaction to the deal.